MILKY WAY GALAXY – In a unanimous decision among the other planets, Earth will be placed in isolation from the rest of the Solar System. 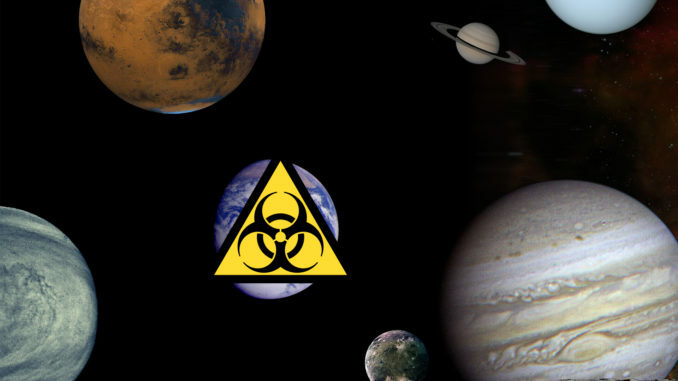 “Earth has had an infestation problem the last two-and-a-half million years or so. It’s gotten so bad that it has begun to spread to Moon. It’s hurting him and he’s not doing anything about it. His temperature’s been going up as well” said Sun. “I mean, it’s not like the other planets don’t have their own problems. Venus is a hothead. Jupiter always has gas. Mercury’s got skin problems. Neptune is blue. Mars is always red in the face. Pluto’s having an identity crisis. Uranus has become ice cold. Saturn is going through the ringer as well” concluded Sun.